Looking to live in a city with smaller town charm? 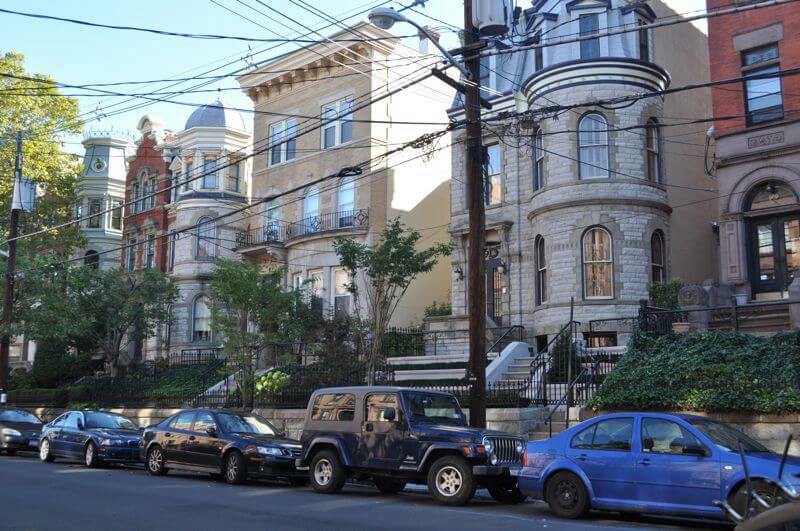 Consider moving to Hoboken – affectionately called, “the ‘boken”. Its historic townhouses and a handful of high-rises Hoboken offers its residents and visitors an echo of big city life. However, with an area of only two-miles², compared with Jersey City’s 21-miles² – you get to experience all the perks of a bigger city at a more friendly and relaxed pace. Then, with ample access to public transportation, Hoboken residents can be standing on a street corner in Manhattan or Jersey City within a reasonable commute time – often 30-minutes or less. Many Hoboken residents have emigrated from NYC boroughs – including Manhattan – or are former Jersey City residents who wanted all the same perks they’re accustomed to, but on a smaller and more family-friendly scale. Here are five reasons you’ll be thankful you moved to Hoboken. Theatres? Check! Great restaurants? Check! Friendly local bars? Check! One of the things Hoboken residents like best is that you can take care of all of your needs in pedestrian-friendly uptown and downtown city blocks. Within a single block or two, you can enjoy a perfect cup of coffee, pop into a boutique or two, drop off the dry cleaning and meet your friend for breakfast, lunch or dinner. No need for taxi’s, no need to walk tiresome blocks, no need to give up multiple hours of your day to get things done. These are just a smattering of the reasons why residents of Hoboken are so proud of their city – and why you’ll be thankful you chose it for your new hometown. Another perk of moving to Hoboken? There’s a single school district – and a staggering array of schools to choose from. There’s a school for every student’s (or parent’s) academic goals and extracurricular interests. The Hoboken Public School District boasts six public schools, serving students in grades K through 12. In addition to integrated programs that serve the general student body, Hoboken’s Public schools have ample support, programs and parent/student resources for students requiring special education. The district also offers a variety of GATE programs to serve and challenge gifted and talented students. There are also several different charter and private schools for parents to choose from, each of which meets the government’s core standards along with their own, unique academic curricula and cultures. There are also a few public charter schools in Hoboken. Charter schools are publically funded, meaning they are free to residents, but they have more flexibility in terms of curriculum and gaining outside funding. Charter schools are typically much smaller than public schools (although not always), which allows teachers and administration to focus on more individualized attention for each student. While donating money isn’t necessary, many charter school ask families to contribute whatever they are able in order to help fund any supplemental art, music and STEM-oriented electives. Finally, Hoboken offers eight different private schools, serving just shy of 1500 students. Private school tuitions allow faculty and staff to offer very diverse and specialized curriculum as well as extracurricular activities that might not be available at a public school campus. The Hoboken Family Alliance hosts an All-Schools Open House each year in October. This event offers prospective and current Hoboken residents a chance to learn more about the area’s schools – including public, charter and private options. Eat, eat and eat some more. From pizza that’s so good it’s requested by brides after their wedding, to international foods and fine dining, Hoboken offers any type of restaurant you can imagine. Shop ‘til you drop in uptown. Uptown Hoboken is known for its excellent shopping. The best part about it is that there are enough stores to satisfy every shopper, but all located within a couple handfuls of walkable blocks, so you’re more likely to “drop” into a pub, wine bar or great restaurant than from exhaustion. Hit the museums and historical hotspots. Hoboken has a rich history, beginning in the turn of the 17th You can sign up to take Hoboken’s self-guided, two-hour historical walking tour or visit the Chamber of Commerce to learn more about the areas history, museums and historical landmarks and highlights. Take advantage of art, music and cultural events. From art galleries and live music venues, Hoboken has an active art and music scene. A range of fairs, markets, and cultural festivals take place year-round, creating a natural rhythm of social opportunities for all ages and interests. Other fun and interesting Hoboken attractions include walking, shopping and dining along historic, Washington Avenue, the Waterfront Walkway, parks, the pier and – of course – multiple points of interest honoring Hoboken’s claim to fame, Frank Sinatra. Residents of Hoboken are proud of the city’s just-right nightlife. It’s not the crazy, all-night party scene of the city (although you can certainly find that if it interests you). Rather, Hoboken offers taverns, pubs upscale cocktail venues and dance clubs dedicated to those who enjoy a night out without the pressure – or price tags – associated with larger area cities. Hoboken’s common nightlife tagline is, “where status does matter,” and that’s something to celebrate. That being said, uptown Hoboken offers a plethora of bars, dance clubs, and music venues – all within walking distance from one another. Together, they create a nightlife environment that is as satisfying for college and post-grad students as it is for parents and retirees who are enjoying a sophisticated night out. A flood of families moving to Hoboken means that property values are on par or can be slightly more expensive than those in many Jersey City neighborhoods. On the flip side, Hoboken’s homes, townhouses, and apartments are notably more affordable than properties in NYC. The good news is that property values are steady and real estate experts expect those prices to increase over time due to increased interest in the area. Most upwardly-mobile professionals find it makes more financial sense to invest in Hoboken real estate as a homeowner than it does to pay the high, rental rates of NYC. That being said, the cost of living in terms of goods and services is equal to or more affordable when compared with other, larger cities. In circumstances where the cost of living is relatively equivalent, fans of Hoboken feel the quality of life makes it well worth it. In fact, quality of life is often cited as one of the best things about moving to Hoboken when compared with its larger, city counterparts. Thinking about moving to Hoboken? Contact White Glove Movers. We’ve got the largest, privately owned moving company in and around New Jersey and we pride ourselves on providing efficient, stress-free moves for our clients. Give us a call – 1-800-340-1911 – or contact us online to get your free, fixed estimate for your Hoboken move.